Liqueo announced today that it has signed an exclusive agreement with RealWorld Marketing of Scotsdale AZ to provide advanced sales and marketing of it’s QR code driven Inventory + Marketing Platform (IMP) to the US auto dealer and auto group market. Built on its proprietary cloud-based platform, Liqueo’s Inventory + Marketing Platform integrates with a dealership’s existing database, automatically generating custom mobile advertising campaigns for each new and pre-owned vehicle on a dealers lot. 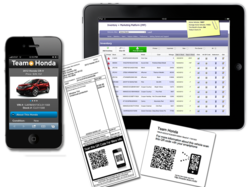 Dealerships can then print QR code-based graphics and QR code enhanced addendum stickers to attach to their vehicles and print advertising. By scanning the QR code on a vehicle or print ad with a smart phone, prospects are led to a custom, auto-generated, mobile website with the vehicle’s VIN specific relevant content including options, mobile-optimized videos, brochures, vehicle promotions, dealership promotions, and feedback forms. “This system is advantageous for both the customer and the dealership. Customers get immediate information about a specific vehicle without the assistance of a salesperson and the dealership can engage with customers 24/7 by providing them rich relevant data at the right time and the right place,” said Allan Tone, CEO of Liqueo. “By leveraging RealWorld’s experience and customer database Liqueo is freed of the day to day responsibility of acquiring new customers and can focus on building, upgrading and enhancing a platform for auto dealers that is already light years ahead of the competition. RealWorld brings “Real World” Automotive experience to Liqueo Inc.
Liqueo is a technology company based in Vienna, VA, that offers a SaaS* platform solution for companies to develop and implement cloud-based mobile marketing campaigns. Using smartphone technology, the platform solution enables companies to engage customers and prospects leading to enhanced sales and product adoption. Companies can leverage the platform to broadcast rich, relevant and personalized content to customers at the right place and at the right time via any mobile device. The platform also allows companies to capture the: who, where and when leading to a more integrated CRM and marketing strategy. RealWorld Marketing is a company with over 30 years of automotive experience. Based in Scottsdale Az with offices in Dallas, RealWorld services Honda and Acura Dealer Associations across the US, creating effective Tier 2 advertising and promotional materials. Founded by Chairman Jay Wilson, who previously owned one of the most successful automotive advertising agencies in the United States, J. Wilson and Associates. Jay has served on brand committees and brand launches for several General Motors divisions. RealWorld manages brand personalities for companies small and large alike, utilizing all mediums from traditional media to the latest digital technology. Their culture and mandate: to create a big idea, and then reach customers everywhere with it.